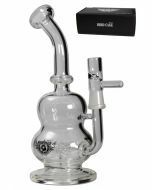 The Black Leaf 'Globe' Percolator Ice Bong is a good looking ice bong with a unique feature: the globe perc, or ball percolator. 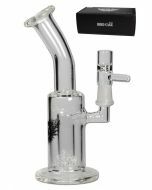 It is made by the German bong manufacturer Black Leaf and is a sure eyecatcher when you place it at home or in the office. 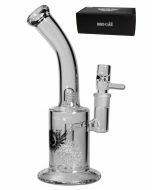 When you take a hit, the smoke first passes through the diffuser downstem into the water chamber, where the first bit of cooling and filtration is handled very effectively. 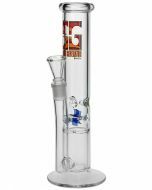 After the lower water chamber, the smokes travels up through the globe percolator, a unique filtration device that is not seen very often on bongs. 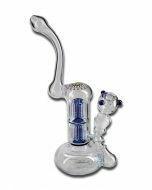 The globe percolator creates vigorous swirling of the smoke and water, which is very cool to see. 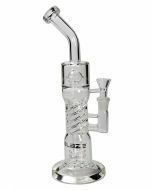 But much more importantly, once the smoke enters your lungs through the comfortable mouthpiece, the smoke is exceptionally well-cooled and -filtered, so it is very smooth on the throat and much less harmful to your lungs, whereas many impurities (such as tar) that are filtered out remain in the bong water so they can be flushed out later. But wait, there's more! If you think the smoke still isn't as perfect as you'd like, you can fill it up with ice cubes and use it as an ice bong! The three ice thorns just below the Black Leaf logo are specially designed for holding ice cubes and preventing damage to the percolator. The included glass bowl has a very practical coloured glass handle. 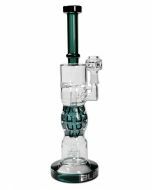 It can be drawn out safely for the extra kick (this bong does not have a kickhole). 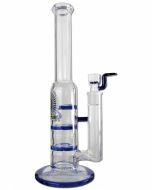 The height of the bong is 28,5 centimeters, a very practical size; large enough to smoke comfortably and small enough to put away in any closet or cabinet. 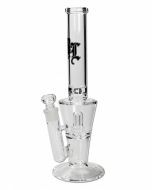 The bong and the bowl are made of high quality borosilicate glass, also known as "hardened glass" or "scientific glass" bongs. To say it briefly, the Black Leaf 'Globe' Percolator Ice Bong is a perfect bong buddy for peaceful days! 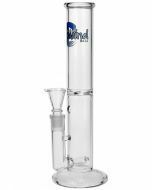 The length of the downstem adapter measured from top edge of the standard grinding is 120mm.